Droom.in provides a platform to buy or sell anything with wheels, as well as all related services such as car care & detailing, auto inspection, warranty, roadside assistance, and insurance among others. Now as a promotional offer they are giving Helmet worth Rs.850 at just Rs.79. You can use Droom App for faster ordering. So follow steps and grab a Helmet for free. 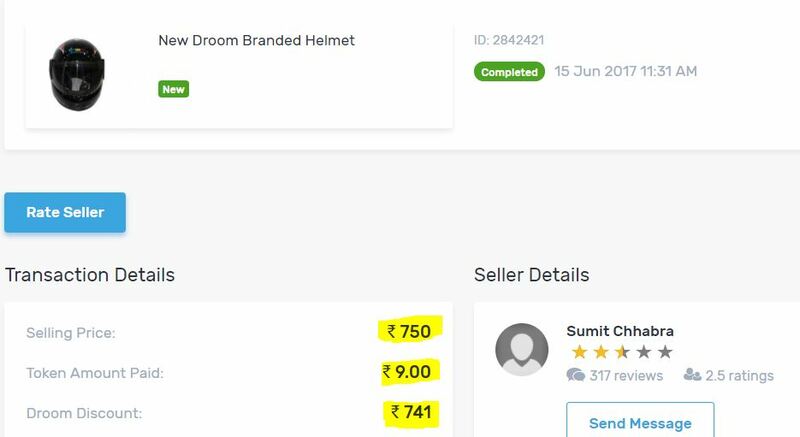 1.1 How to Buy Helmet at Just Rs 79 From Droom.in? Droom has come up with its flash sale where you can buy Helmet at just Rs.79 only. The flash sale will be live on 9th May 2018 at 11 AM. To avail this deal, you need to register for flash sale. Original price of the Helmet is Rs.850, but as a promotional offer, they are giving it at just Rs.49. Limited stocks will be available during the sale period. You need to be super active to grab the Helmet at the lowest price. How to Buy Helmet at Just Rs 79 From Droom.in? Tip: Please note, site may down due to heavy traffic, So install Android App and signup for the sale for faster ordering. Now Login or Sign up for your account. We successfully ordered Helmet at just Rs 9 from their Previous sale. See below screenshots. Share this post with your friends and keep visiting Recharge Addict for more exciting offers. Making fool of people. Shame to you droom. I am so interested to register a mi mobile phone only rs. 1 it’s a very useful item.